Moderator: Hello. My name is Murtaza Solangi. I’m a broadcast journalist and director general of Radio Pakistan. I am joined by Secretary of State Hillary Rodham Clinton today. And I have a panel of eight radio gurus here who work in different capacities in the different radio outlets. This is a combination of a group of both private and public radio people. First of all, we welcome you here. I will ask you the first question and then we will go to everybody. They will introduce themselves, who they are, and they will ask the question. And we’ll go in a circle until our time runs out. Well, paradoxes abound. Your trip to Pakistan this time, which is your fifth trip, as you just said, and your first official trip, has been categorized as “charm offensive.” (Laughter.) And since you are almost at the end of your trip, so my question would be: What are the achievements of this trip both for United States of America and Pakistan? SECRETARY CLINTON: Well, thank you for the question, and thanks to each and every one of you for participating in this radio roundtable. I think it would be fair to say that my trip is part of our commitment to a long-term relationship with Pakistan. And as I have said in several different settings, we want to turn the page on what has been a strained and somewhat difficult period in our relationship. Now that Pakistan has a newly elected democratic government, we want to fully partner with you on not just security, which has been the driving force of the relationship for the last several years, but on a broad and comprehensive agenda that includes everything from electricity to water, health to education, women’s rights and empowerment, to agriculture — just the entire range of concerns that have been expressed to us by the people and Government of Pakistan. I came with a very specific desire to listen and to try to answer questions and confront some of the unfortunate feelings and attitudes that I know exist in Pakistan today toward the United States. I came with the announcement of several projects that we have been working on through the last nine months on everything from help, to your electricity system, to a new program for young people to use their cell phones to communicate and to build networks of citizen activists around the country. I think we have a lot of work to do, but I’m encouraged by what I’ve heard. And I think my hope is for the kind of positive, comprehensive partnership where we can speak freely and openly, where we listen to one another, where we agree to try to work together, and where we have disagreements, to air them and try, if possible, to resolve them. And I think we’ve had a good start, but there’s a lot of work ahead. MODERATOR: Thank you. You have been advocating human rights, and I remember your slogan: Women rights are human rights. And let me give the chance to one of our female broadcast journalists from Quetta. She’s on the phone with us. Neela Ilyas, would you introduce yourself and ask the first question to Madame Secretary, please? QUESTION: Okay. First of all, I would like to say asalaam wailakum to those who are listening to me. My name is Neela, and I’m broadcasting from FM 105 from Baluchistan. And my first question is also regarding with the health and humanity, as you were talking about. The belief of mine is that men should not – men should take your maximum opportunity (inaudible) education for all. Sound health, a vision of good life and considering woman is a total source of peace and prosperity as man is, and ensuring that a man – that a child of today is nation builder of tomorrow, regardless his or her caste, religion, color, and (inaudible). So my question is also related with the same child as we all are really much well aware about the child labor that is really much (inaudible) all over the (inaudible). We can talk about Pakistan and especially with Baluchistan, we are having this really great and burning issue of our current experience that the child laborer is increasing its – by, you know, the society is by the low categorized people (inaudible). Why is it so? SECRETARY CLINTON: Well, thank you, Neela, for that question. I started off in public service working on behalf of children and children’s futures, so I am particularly sensitive to the problem that you just raised. SECRETARY CLINTON: Child labor is a problem. It’s a problem not only in Pakistan, it’s a problem in many countries. And part of the reason for it is, number one, families need extra income, so children are sent out to work, and often at the expense of their education. There is also a problem that there aren’t enough schools for children to attend. And therefore, they are left to their own devices and so they take on jobs or they are put into almost forced labor situations. And I think it’s important that we tackle the problem of child labor. It is not always the case that it is injurious to a child, but in many instances it is. The conditions under which children work, the exploitation of children, the fact that many children are not paid fairly for the work that they do. The situation in some places in the world, including here in Pakistan, of bonded labor or other forms of forced labor, means that governments need to stand up for children’s rights to be children, for children to get an education, for children to be cared for. QUESTION: Sorry to cut you off, but I’d also like to bring some more issues, like we are having with child exploits of sexual, commercial exploitation, not even that so the child laborer, the trafficking, the smuggling. These all are the really, you know, important issues which we are neglecting day by day. What do you think? So does it sound good? SECRETARY CLINTON: We need strong laws in every country, we need to enforce those laws, and we need to make sure that children are rescued from being exploited in such cruel and inhumane ways. MODERATOR: Neela, we’ll get back to you. Please stay on the line, because we have to have a round of questions. MODERATOR: So you’ll get another chance. So stay with us. Let’s move clockwise and give the folks a chance. QUESTION: Madame Secretary of State, I had the opportunity to cover tripartite dialogue between America, Pakistan, and Afghanistan this week. I also was there at the time of the briefing, that briefing by you and the presidents of Pakistan and Afghanistan. And I am watching the those tripartite dialogue and (inaudible) are taking place to meet the common objectives to combat extremism, terrorism. But sometimes I wonder that, you see, despite all this intensive consultation and coordination between the (inaudible) countries and all of the regional powers since President Barack Obama took power, there are still sometimes, (inaudible) they become so clouded that whatever the progress has been made on certain issues or arguments which have been made, they somehow go in the background and (inaudible) and all that achievement (inaudible) also. So what is your (inaudible)? SECRETARY CLINTON: Well, thank you for covering the tripartite dialogue, because we think it’s a very important opportunity for the United States, Afghanistan, and Pakistan to work together to solve common problems and to try to create some very positive outcomes. And of course, it is true that sometimes disagreements get magnified. But I think that it is important to stay with the consultation and the negotiation. This is absolutely critical to any progress we might make. One of the first things that Ambassador Holbrooke raised at the very first tripartite meeting was a trade transit agreement between Afghanistan and Pakistan. Pakistan has an enormous amount to gain by opening up more trade into Central Asia, which could be done by moving across the border more efficiently without obstacles. So that was started back at the meeting you attended. There have been several meetings between our governments. And we’re hopeful that such an agreement will be signed by the end of this year. So positive change can come, not easily, because there often has to be a lot of careful consideration and analysis and we have to listen to each other, but it is far better than the alternative of either ignoring the legitimate interests and needs of the other county, or, as you say, having disagreements that get out of hand because there’s no forum or venue to try to rein that in. So I think it’s a very positive development. MODERATOR: Now, we go to Najib Ahmed. Najib Ahmed represents an independent FM network, FM Power 99, as it’s called. of (inaudible) that is known as Association of Independent Radio Broadcasters. I am the first channel which came after the (inaudible) to come on air, and we started broadcasting in 2002. And now, there are about more than 100 radio stations covering (inaudible) radio stations broadcasting in different parts of Pakistan. And right when the (inaudible) radio came on air, the value and importance of (inaudible) FM station became more important. It was very much (inaudible). And the U.S. side as well, there is (inaudible) importance to the (inaudible) radio station. But unfortunately, the conditions here in Pakistan which I feel that our journalists here will be in a better position to tell, that we don’t have that much technical and professional facilities here, or trained or different kind of staffs here. There are – of course, there’s the USAID-funded organizations giving some support to some of the radio stations, but we do need an aggressive approach towards this because if these radio stations are vulnerable economically or technically, they may become victim – you see they may go in the hands of very dangerous people. And like we have seen in the more rural areas, most of the radio stations are doing unethical advertising. And for this, of course, there is some work that’s being done, but we want to know what support and what effort, other than retraining, U.S. Government is going to give to the Pakistans to improve the situation in the broadcasting (inaudible) the broadcast sector. SECRETARY CLINTON: Well, it’s interesting that you raise that, because one of the comments that was made to me in the last day is that we are losing the information war. We may be winning the military war in Pakistan, but a Pakistani said we’re losing the information war. And I think what he meant by that is that the extremists run their own FM radio stations, as you know. They are very small mostly, but there are many of them. There are many illegal, but they operate and they are used for propaganda purposes, to intimidate people. You know better than I all of the impact. So I think we do need to look at the broadcast industry and figure out how there can be more support, and particularly in areas that don’t have a lot of coverage now. I would imagine that in some of the rest of the country, there’s a lack of different voices and information. But I know that Ambassador Holbrooke’s team is working on a whole communications strategy, so I would hope we could follow up and speak with you about that. MODERATOR: We go to Colonel, Retired, Khalid Munir. He represents FM 88, Laki Marwat in the NWFP province. Please. QUESTION: Madame Secretary, my FM is the only FM now which is being heard in South Waziristan. QUESTION: In the battlefield. What I would like to ask you is the operation is underway in South Waziristan. If it is successful when 5 percent of our military (inaudible) will be solved, but will the USA will be satisfied with South Waziristan operation only or you would like that everywhere with the networks out there they should be taken care of, apart from (inaudible)? SECRETARY CLINTON: Well, first let me say that I think that the Pakistani army is doing an excellent job. I was briefed at length by both General Kiyani and General Pasha last night, and the operation in Swat and the operation insofar as it’s going in South Waziristan seem to be quite successful. It is just my opinion, and I discussed this with the generals last evening, that there is this syndicate of terror now, and defeating it in one place doesn’t guarantee that you will have defeated it in every place. I think that going into South Waziristan sent a very good message, because that was a center of a lot of the terrorist operations and planning. But because I do think there’s a network, it is very likely that the remnants of this network – informed by, trained by, equipped by and funded by al-Qaida – will strike again at the Government of Pakistan, as it has been. I think that the attacks on the GHQ, the attacks on police stations, all of this is a direct assault on the writ of government and the sovereignty of Pakistan. And so it will be important to watch that and to evaluate if there needs to be additional actions. That, of course, is up to the Pakistani Government and military. But it is important in this kind of war, which is an asymmetrical war – it’s an insurgency, it’s a guerilla operation, it has very few of the hallmarks of what you were trained to do when you were in the military – therefore, you have to be constantly adjusting your tactics in trying to deal with it. It’s something that we learned after a very painful set of lessons in Iraq. And as you know, General Petraeus, who was our commander in Iraq, is now commander of CENTCOM. General McChrystal, who was in charge of special operations in Iraq, is now our commander of the international forces in Afghanistan. And they have very close communication with your military leadership, because everybody is learning. I mean, this is a new challenge to deal with this threat. So I don’t know what the next chapter will be, but I’m very impressed at the chapter that is being written right now. MODERATOR: Thank you. We go to Farishta Shaykani. She heads PACT Radio in Peshawar, NWFP province. Farishta. QUESTION: Pleasure meeting you, Madame. I’m Farishta Shaykani from PACT Radio, Pak-Afghan cross-border transmission, training, and production (inaudible), working across the region. My question is about relationship between Pakistan and Afghanistan, because they are both very near, very neighbors, but the relationship is always on/off. Whenever a critical situation happens in Afghanistan, Pakistan is being blamed. Whenever something happens in Pakistan, Afghanistan is being blamed. What role can U.S. play regarding solving these kind of issues? SECRETARY CLINTON: Well, we hope to play a positive role in working with Pakistan to help stabilize Afghanistan. I think that there is no doubt that a stable and secure Afghanistan is in Pakistan’s interest, because you don’t want there to be across your border a safe haven for terrorists, you don’t want the people you are chasing out of South Waziristan to find a safe place over on the other side. So it’s very much in both the United States’s and Pakistan’s interests to try to create a stable situation in Afghanistan. And I’m hoping that through efforts like the trilateral dialogue that Mr. Abbas was talking about, we will help create a better understanding and relationship between Afghanistan and Pakistan. I mean, it’s fine to be competitive with your neighbors over things like trade or football or whatever it might be, but I think that it’s in everyone’s interest to try to create a much more stable, peaceful, friendly relationship between the two countries. MODERATOR: And now we go to Iram Abbasi. She represents an FM network called 106.2. They have stations across Pakistan. Yes, Iram. QUESTION: Thank you. I’m actually Iram, working for 106.2 Hum FM station.. We’ve got Karachi, Lahore, (inaudible) Peshawar (inaudible) the network. And beside that, I’m also working for an organization (inaudible) which is aimed to develop the professional capacity of professional females working in (inaudible). This is (inaudible). So, actually, I’ve got (inaudible) as well as (inaudible) especially the professional and within the industrial, I’d like to know how you guys are going to go and – you know, in the affected areas, how you going to uplift the female and their education and their (inaudible) as again, as you said earlier. But knowing the importance of radio, how do you intend to use radio for that particular reason, for that particular group, and specifically females or, you know, the professionals working in radio, how do you think you can utilize their abilities and their work towards that particular goal, you know, to achieve in those affected areas? SECRETARY CLINTON: Well, I think we will have to look to people like you who have the expertise and the experience to advise us about how best to use the electronic media. This has been an area of great concern to us because we know that the terrorist groups are getting quite sophisticated. They use the internet, they use radio, in particular, in getting their message out. And it’s very important for what happens to women in some of these areas where the extremists have tried to turn the clock back on women, and they have tried to use radio to send messages about what women should or shouldn’t do. I mean, they use the radio to say that women shouldn’t go to school, that women shouldn’t go out of their homes. And that’s very intimidating and very frightening. And so there needs to be a program using the electronic media, and there is no form of the media that is more important in both of your countries, but particularly in Afghanistan, than radio. I’m a big radio fan. I listen to the radio all the time when I’m at home. I listen to what we call National Public Radio. But I know how important radio is to getting the right information to people. And it’s not only information about their security, but information about education, information about health. There’s a lot we could do. But we will have to look to you to give us advice about that. MODERATOR: Thank you. We go to Alamagir Bhittani. He represents VOA Deewa Radio that focuses mainly on the border region of Pakistan and Afghanistan. QUESTION: Thank you, Solangi. I am Alamagir Bhittani. I am working with VOA Deewa Pashto (inaudible). We cover the southern district of North-West Frontier Provinces, including South Waziristan and North Waziristan. Madame Secretary, my question: It has been observed that U.S. has halted the use of drone attack in Waziristan since Pakistan launched operation. What is the strategy? Will it continue, or it will remain suspended during military campaigns here? SECRETARY CLINTON: I am not able to comment on that, but I think it is very important to point out that there’s great interest on the part of our military and our government in the United States to assist the Pakistani Government and military. So we’re well aware that they are engaged in this very critical fight in South Waziristan, and they’ve asked for certain material, they’ve asked for certain equipment, they’ve asked for certain technology. We’re trying to get whatever they ask for to to them. Because I think that they’ve got to win. You’ve got to win. I don’t have any doubt about that. And from my conversations last night, every possible effort is being deployed to win in South Waziristan, then to try to do reconstruction in both Swat and Malakand in South Waziristan, and we’re going to help on that, too. MODERATOR: Thank you. Now we go to Nisar Khan. Nisar Khan is representing Radio (inaudible) Radio Peace in Mardan, again the province of North-West Frontier. QUESTION: (Inaudible) I am Nisar. I am (inaudible) alum of Mennonite University of Virginia. QUESTION: Yes. I am – I was (inaudible) to Pakistan – was not now. Now I am looking after and consulting for this project – (inaudible) projects which has been (inaudible). And we are promoting FM radio (inaudible) some (inaudible) radio stations are to be restored in the Frontier Province, because I think – my question is coming just now – I think (inaudible) radio community (inaudible) it should be the proper radio to integrate with my common man. And for this purpose, we have announced some (inaudible) radio stations and we need (inaudible) FATA, and the American Government is helping us. But I am of the view that the project is wearing down. They are going to stop it I fear. And it should not stop because each inch of our province should be interconnected by peace promotion. QUESTION: Once I interviewed (inaudible). I asked him a question, I asked him a question where of how peace in Afghanistan would be possible. He said it is really simple: There should be community interaction on peace promotion. Anyhow, so the community (inaudible) it is very special. In our area, you are better known (inaudible). (Inaudible) this area is – there are some 3,000 (inaudible). But peace – real peace progress and now we have started the first FM radio of peace in Alexander the Great and (inaudible) for peace. They were peace stalwarts, just two or three, four, days before. And we get feedback, some 70, 75 telephone calls daily from (inaudible) and we have (inaudible). So I will request that it should be continued (inaudible) stations. It must (inaudible), because to win a war is very simple, but to maintain peace is very difficult. QUESTION: So (inaudible) to our effort (inaudible) the request. And question also that it should be – FM radio should be promoted through Pakistan not only (inaudible) but in our tribal (inaudible) also because we have got only three station there and cyber net. So (inaudible) even discuss this problem, but anyhow, I will request on FM to be continued (inaudible) project (inaudible). SECRETARY CLINTON: Well, I will look into that. I’m not personally familiar with it. But I will certainly look into because, as I believe and as I’ve said, I think radio is a very important instrument in trying to create an atmosphere for peace, in trying to convince people to negotiate for peace, to live in peace. So I will look into that. QUESTION: Thank you, Madame Secretary. At the end of this session, I’ll briefly tell you the radio environment in this country, both public and private, and what are the major challenges we all are facing. Let me go straight to a question, since this is my turn to ask a question. There are certain figures floating around since you have come to Pakistan – 145 million and then 85 million and 45 million allocations. In today’s newspapers there was a question, even the press attaché of U.S. Embassy was asked, and he said he will check back and get back to people. Are these announcements of Kerry-Lugar law, or are they separate? SECRETARY CLINTON: They’re separate. Yeah, Kerry-Lugar – the law has passed. But we have a two-step process in our system: You have to pass the law and then you have to appropriate the money. And so the law has passed, but we haven’t had the opportunity to appropriate the money yet. So this is an increase in assistance that we are taking out of our current budget to jumpstart our partnership. MODERATOR: There’s news right there. We go to Fakhar Abbas. Fakhar. QUESTION: Again, I will raise the question because the (inaudible) whether it is through media or whether it is through governments, other sensitive to (inaudible). That’s the way it is. You have been working for peace and anti-Vietnam war activism and after that, during President Clinton’s tenure you have been also part and parcel of (inaudible). And now you are also part of a very important initiative to bring peace in the region. But you see, still there are certain issues which sometimes are raised. For instance, through media we have come to know that you said that al-Qaida is (inaudible) Pakistan. And I’m surprised that the people of Pakistan or the Government of Pakistan don’t know that. Since you had intense civil dialogue with the civil and military leadership of Pakistan, and obviously you must have raised this issue along with other issues, what was their response? SECRETARY CLINTON: Well, first let me say that we’ve had very good discussions, and we’ve covered a broad range of issues. It is our information that the leadership of al-Qaida is in Pakistan. We don’t know where, and we are very committed to pursuing them because of their attack on us, but I also believe that the Government of Pakistan is as well. It’s a question of priorities. They are going after their most direct enemy right now, the Pakistan Taliban and some of its elements. But as I was saying to the colonel, I think it is absolutely clear, and I am convinced, that you will never rid Pakistan of the threat of terrorism unless you rid it of al-Qaida. And it’s very personal for me because of what happened on 9/11. I was a senator from New York and spent a lot of my time during my eight years in the Senate working both to help the people who were affected and to try and prevent another attack. So when we have an arrest like we did some weeks ago of a man named Zazi and we find out that he was trained in an al-Qaida camp – not a Taliban camp, an al-Qaida camp in Pakistan – we feel like we have to go to the Government of Pakistan and say, “Somewhere these people have to be hidden out. We don’t know where.” And I have no information that they know where, but this is a big government. It’s got – a government on many levels, there are local governments and national governments just like there is in any country. Somebody, somewhere in Pakistan, must know where these people are. And we’d like to know because we view them as really at the core of the terrorist threat that threatens Pakistan, threatens Afghanistan, threatens us, threatens people all over the world. MODERATOR: (Inaudible), it’s your turn. QUESTION: I remember back in the ‘80s, there was one program teaching of English through the radio in the NWFP. It was very good through the Radio Pakistan, but then it was stopped later on. I believe in the geographical condition of Pakistan and looking into the troubled area and lack of (inaudible), the scarcity of the teachers, there has to be one interactive radio for instruction, so that gives (inaudible). I proposed this to (inaudible) before, but they did – they started this program, but not onto the radio. They provided the CD players to the schools. And then you see the management of the CD player because they couldn’t manage that. What do you think, is there any possibility of supporting the education sector through the radio by – through interactive radio for instruction? Any plan for this? SECRETARY CLINTON: Well, I think it’s a very good idea and I will look into it, because I believe that it’s one of the best ways to get into more homes and have more listeners. And I agree with you that it’s more efficient than CD, it’s more pervasive than the internet, so I think we should look into it. I agree with that, and not just English but other things as well. QUESTION: And then mathematics can be taught (inaudible). SECRETARY CLINTON: Or information about health or other things, right. MODERATOR: Well, we go from one colonel to the other colonel, Colonel Khalid Munir, again, please. QUESTION: Madame Secretary, you’re going to select a man and send him to Afghanistan as a commander. When he asks you for – he’s the best man – best judge (inaudible) as far as the (inaudible) are concerned. General McChrystal three months back have asked you for more troops. That was his assessment base. So far, he has not been provided them. And then pessimistic responses from General Mullen – Admiral Mullen coming that we will talk to Taliban, whereas we are fighting with the Talibans. And then a statement from U.S. State Department or from Admiral Mullen come that we will talk – we may talk with the Taliban. It demoralizes the people over here that we are fighting them, and America is going to get into negotiations with them. Is it (inaudible)? SECRETARY CLINTON: No. But let me try to clarify it, because that’s a very important point. First, as to General McChrystal’s request, the President is taking all of that under consideration. And his timing was to do this after the Afghan election, which, as you know, is not yet over. Because as General McChrystal writes in his analysis, you cannot win just militarily, you also have to have a political component, and that is dependent upon who is in charge in Kabul and the work and the commitment that the government in Kabul will make. So it’s all part of a whole. So there’s not been any final decision made, and I – so I don’t think that anyone can draw any conclusions about what the President will or will not decide. I don’t know how many people are in that category. We don’t know yet. But we think it is important to send that message because we want young men to know that they can return to a peaceful society if they renounce violence, if they are willing to get back to just living a normal life. And I think that’s the same approach your military has taken. I mean, you go after the bad guys, but you know that there are going to be those who escape out of wherever you’re waging your military operation. And you have two choices. You can just assume they’re going to go the right way, or you can try to persuade them to go the right way. And I think that’s what we’re talking about. MODERATOR: Since – we are in the second round of questions, so if anyone offers – doesn’t feel like asking a question and let it pass, you are welcome to do that. Would you ask, please? QUESTION: Yes. Madame, I would like to ask again about the operation going – in both sides of the border, Afghanistan and Pakistan. On one hand, you are appreciating negotiations and you are talking about negotiation. And in other hand, the operations are being encouraged and appreciated. So don’t you think that somehow, these operations can make people go more against government and against U.S.? 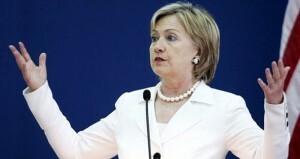 SECRETARY CLINTON: Well, I think it depends upon how it’s handled. I think if it’s handled in a very professional way where there’s an emphasis on the reconstruction, as I know you’re trying to do in Swat and which we are helping on, that there is an effort to try to make the people’s lives better, I think that that can be successful. But first, you have to rid the areas of the active terrorists, and I just met with a group of people from the FATA and the Northwest Frontier Province who said, “We are not involved in this. We are being the victims of it. These people, they come to our communities, they intimidate our people, they do terrible bombings like they did in Peshawar the other day.” I mean, it’s horrible what they do. So I think the people who live there, the vast majority of people, they want to be rid of this. But it’s dislocating. People leave their homes because they’re in the way of the battle. And so we just have to look at this not only from the military operation, but what comes after the military operation so that we can restore normal life and actually make it better for people. And I know that’s what your government is trying to do. QUESTION: Yeah. Actually, I’d like to talk here about youth, because, you know, we really have to see what they are going through, and I think I can see exactly how they’re feeling with the current situation – you know, the extremism and the terrorism – because they’re really actually scared to go to school. They’re, you know, demoralized. They don’t know what to do and where it is going. So, you know, I think we really need to cure this mental illness – what they’re going through, really to take them out of it. And for that particular reason, we have to work on some ideas through which we can entail them and (inaudible), you know? We can work on education, we can work on healthcare, but we have to work for their – to take them out of this mentally illness through providing them a platform where they can have healthy entertainment or healthy activities, you know, to cheer them up. SECRETARY CLINTON: Well, look, I think you’re right. And what is the purpose of terrorism? It is to terrify people. SECRETARY CLINTON: I mean, the terrorists win when people stop living their lives, when they quit going to school, when they quit going to work, when they don’t go out of their home. The terrorists win. So I think you’re right that we have to send more messages of confidence building and solidarity so that people realize one of the best ways we can defeat the scourge of terrorism is by not being terrified, not being intimidated, standing against this, as hard as it might be. Now, it’s easier if you’re in Karachi than it is if you’re in Peshawar. I mean, that’s just easier because you’re on the front lines. But everybody needs to be supporting each other in standing against the terrorisms and – the terrorists and to show resolve in trying to defeat this scourge, because it’s not right that young people would be deprived of going to school, that their university, as we saw here a week or so ago, it would be subjected to bombing. I mean, what kind of a war is that? It’s so cowardly. It is so pathetic that these people go after women and children in a market or go after students or go after the police or go after the military. I mean, at some point, the people of Pakistan finally, I think, realized that you can’t accommodate these people, you cannot live with them because they’re trying to take over your government. They’re trying to take over your state. They’re trying to intimidate people. So I think that young people have to know that this fight is for their future, and anything you can do to communicate that. MODERATOR: Alamagir, you have a chance for a quick question. QUESTION: Yeah. The people of tribal area were accepting on the money now implored in Kerry-Lugar bill will be spent in (inaudible) just as to what effective area, but there is confusion now. The question is where the money will be spent, what effect will FATA and North-West Frontier region on war in Pakistan? SECRETARY CLINTON: Well, I think that there’s going to be an emphasis on the tribal areas – on FATA, on the NWFP. But that won’t be the only place. But I think that there will be an emphasis placed on trying to help provide that better future for the people who have been suffering the most because of this. QUESTION: I’m Nisar (inaudible) from FM Radio Peace. We broadcast from Peace Radio how terrorism, the people should be educated, people should be even entertained against this terrorism through music, through our cultural heritage, we can promote peace. So we are doing all these things. I received a telephone call from my realtor. He asked me that – look, you are doing everything for us, but you asked your government – my government are – money, he said that the (inaudible) system in NWFP – most of the press may not be aware of, that that there is (inaudible) system in effort to (inaudible). Some – a farmer is (inaudible) money – he receives money from his landlord, some 2,000, 3,000 (inaudible). But in (inaudible), it is common that he get money and (inaudible) money, he is (inaudible) generations. Yet some comes – that money does not come. MODERATOR: I’m sorry, your question? Your question? SECRETARY CLINTON: Is this the bonded labor problem? MODERATOR: He lost me. He lost me. QUESTION: Did you spend money for everything? Why not fund for our slavery abolition from this area? SECRETARY CLINTON: — labor, which is a kind of modern form of slavery. It is wrong. And I think that the government and the people of Pakistan should not tolerate this, and the individuals who exploit this labor should be punished. There should be laws against it. So – I mean, people who work should be paid a decent wage and should be treated with dignity. So I appreciate you raising that. QUESTION: Madame Secretary, I have a question on Kerry-Lugar and – law and I have a question on Afghanistan. It’s your preference to take both or one? SECRETARY CLINTON: How about one? QUESTION: Okay. I’ll ask the question on Kerry-Lugar law. In some Pakistani media and folks who shape public opinion, today I was reading in a very important newspaper saying, okay, economic assistance, no conditionalities, no certification needed, let’s take that military assistance. Since there are a lot of conditionalities, let’s say no to that. Is it possible? SECRETARY CLINTON: Well, Pakistan doesn’t have to take any aid. Absolutely; you don’t have to take any aid. But we have certain rules for our military aid that apply to everybody. We do expect to have some accountability when we provide military aid because we don’t want to see the military aid used in a way that might be questionable. But I think the military-to-military relationship in – between the United States and Pakistan is at a new level of trust and confidence. The relationship between Admiral Mullen and General Kiyani is a close, personal one, not just a professional one. And I think that the military knows that we support them in their struggle against terrorism. We have provided, by far, the most equipment and most support that they have received from anyone. But we do have a system of accountability that we expect when we give people military assistance, and I think your military understands that very well. QUESTION: So you are saying it’s possible that part of assistance could be, you know, gained and the other could be declined? SECRETARY CLINTON: Oh, yes, of course. I mean, we are offering – we have historically offered a lot of aid to Pakistan, but in the last eight years, we’ve offered a lot of military aid. And what we were trying to do with the Kerry-Lugar bill was to make a long-term commitment to the economic development of Pakistan, to the human development of Pakistan. But no country has to take aid. I mean, that – it’s a free choice on the part of any country as to whether or not they want aid from the United States for anything. QUESTION: You lost. I just got to congratulate you on your successful visit to Pakistan. SECRETARY CLINTON: Thank you. Thank you. QUESTION: Because I heard from all the people whom I know, and this is (inaudible) in Waziristan. SECRETARY CLINTON: Of course, of course.